The Champions League has been able to evoke emotions from fans over the years like no other competition across Europe. Sadness, joy, disappointed, pride, jubiliation, anger and many more. Today, we present you with the crème de la crème finals in the history of Europe's premier competition. Let’s start with Real Madrid and Atletico Madrid’s memorable contest at the Estadio da Luz in Lisbon back in 2014. Diego Simeone’s men arrived for the Champions League final just days after lifting the La Liga trophy at the Nou Camp, and looked set for a memorable league and European double after Diego Godin capitalised on an error by Iker Casillas. Real Madrid pushed hard for the equalizer from that moment onwards, but the coveted quartet of Cristiano Ronaldo, Karim Benzema, Gareth Bale, and Angel di Maria hit the red defensive wall of the Los Rojiblancos. Atletico’s defensive solidity kept them ahead till stoppage time. But 90 seconds from the end of the five-minute stoppage time, Sergio Ramos jumped above everyone else to break Atletico Madrid hearts finding the net from a corneer. The game then headed into extra time, and turned out to be a totally different affair with Real Madrid running riot to win their La Decima. Although the scoreline at the final whistle did not do justice to the drama that unfolded at the Estadio da Luz in Lisbon, Real Madrid and Atletico played out some outstanding bit of “attack vs defense” football to leave the footballing world in awe. Arsene Wenger is one of the most famous names in European football, but the Champions League title eludes the French tactician. The closest Wenger came to clinching the Champions League trophy was back in 2006 at the Stade de France in Paris. Although they were down to ten men for most of the match, Arsenal and Wenger were just 14 minutes away from sealing the title that night. Jens Lehman’s red card in 18th minute made him the first player to be sent off in a European Cup final and it tore apart the English team’s plans in the final after they made an impressive start against the Spanish giants. However, Arsenal bounced back and scored the all-important first goal in the 37th minute through a thumping header from Sol Campbell. Even though Barca had the numerical advantage, Arsenal kept them at bay till the 76th minute before Samuel Eto’o fired home the equaliser. Within four minutes, Barca went ahead as Henrik Larsson set up Juliano Belletti to give Barcelona their second European Cup, and first after 14 years. In the ten title winning runs of Real Madrid in the European premier club competition, the first trophy win in 1956 at the Parc des Princes in Paris holds a very important place. The stars of the Los Blancos were up against the dominant French side of Stade de Reims in the 1956 European Cup final. Ten minutes into the match, Stade de Reims were 2-0 up through goals from Michel Leblond and Jean Templin. Real Madrid were on the back foot, but they made it 2-2 before the half-time with iconic forward Alfredo di Stefano and Héctor Rial scoring the goals. But, the roller coaster nature of the match did not end there. Stade de Reims once again took the lead after the break to leave the mighty Los Blancos needing another comeback. The pressure from Real Madrid eventually broke the floodgates, and Marquitos and Rial scored in the 67th and 79th minutes respectively to win the first-ever cup for Madrid. After trailing the Bavarian giants for almost the whole of the 90 minutes, Manchester United scripted one of the most memorable Champions League finals by smashing in two goals in three minutes in stoppage time. The magical night in Camp Nou had started horribly for Sir Alex Ferguson’s men following Mario Basler's early free-kick. With Roy Keane and Paul Scholes absent in the midfield after suspensions, United struggled to keep control of the midfield. As the “Fergie time” approached, United fans hoped against hope for an equaliser. The manager brought on Teddy Sheringham and Ole Gunnar Solskjær in the hope of a goal as the final minutes approached. With the trophy in sight, Bayern Munich took their foot off the pedal and allowed the English team to press ahead. Teddy Sheringham first diverted a scuffed shot from Ryan Giggs to the back of the net, before Solskjær won it for United with a finish from a close range to cap off a memorable comeback. "This is the greatest moment of my life and I'm struggling to take it all in," Sir Alex said after the game. "I haven't said anything to my players yet. I've just hugged and kissed them. I've slobbered all over them." The emotions of Sir Alex Ferguson brilliantly explain the memorable day in the history of Manchester United. Arguably the greatest comeback in a final happened at the Atatürk Olympic Stadium in Istanbul in the 2005 Champions League final. Folklores have been written about the night in Istanbul, and the names of Liverpool players, who played that night, have been etched in eternal memory. The miracle that happened in Istanbul have been told and retold a million times, but the story still remains as exciting as the first time. Powered by the belief showed by the fans, Liverpool scored three goals in a matter of 15 minutes to make it 3-3 on the night, to leave AC Milan in shock. The next thirty minutes of normal time and the extra time was about a flurry of near misses for the Italian team. 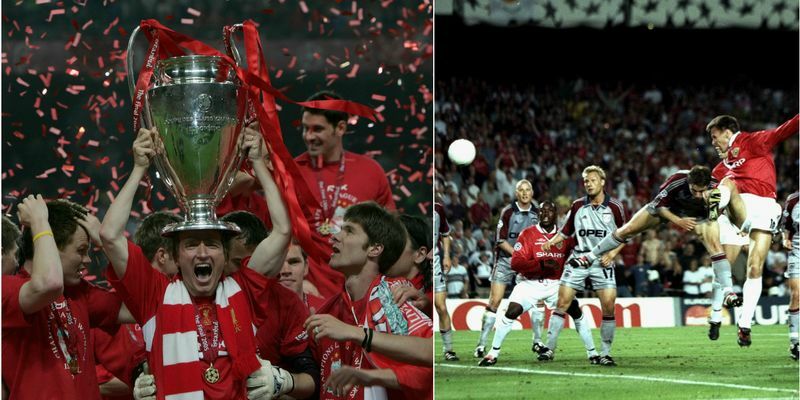 Liverpool held on and took the match to a penalty shootout before Jerzy Dudek used Bruce Grobbelaar-esque tactics to deny three AC Milan players from scoring their penalties, and guided Liverpool to their fifth European Cup title. Cricket enthusiast, Liverpool FC fan, Critic of everything.